We at 1-StopAsia would like to take the time to acknowledge and congratulate one of our fellow colleagues on an accomplishment he achieved within the translation industry. Penko Stoev, an Account/Project Manager here at 1-StopAsia has recently had an article published in “The Elia Handbook for Smart PMs Volume 3”, by Elia, one of the leading non-profit trade associations for the language services industry in Europe. Penko’s article has been listed among the best guides and help-tools in assisting and helping Project Managers advance in their job and overall performance—not only giving them keys to becoming a better Project Manager but also showing them how to perform their job in a way that betters their relationship with their clients—which in general increases the success of the overall team and company. 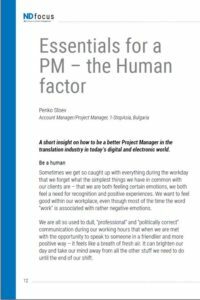 The Project Manager’s responsibilities are defined by the scope of their project. Their primary objective and focus is to understand and accurately present the details of the project to those responsible for working on it, to pay close attention to detail ensuring that the results are what the client has asked for, and to deliver the project back to the client on-time—all while maintaining a professional and most importantly satisfactory relationship with the client, keeping in contact with them as needed during the duration of the project. And that responsibility expands to Project Manager’s within every industry, with a few added responsibilities here and there depending on the industry. 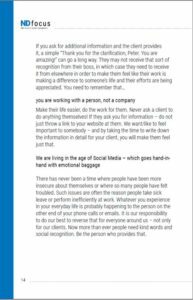 Penko’s article speaks about the human side of doing business and emphasizes on the importance of being professional—but mainly, being a human-being first, understanding the real everyday difficulties of the client and implementing that understanding in how they do business. 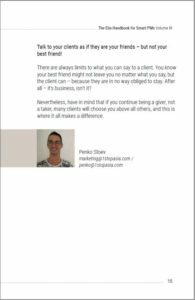 Penko’s article also focuses on the significance of making the client feel like a person, not a client, which is very important in the overall success of the relationship between the company and their client. 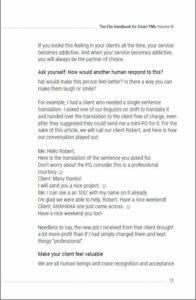 With questions such as, “How would another human respond to this…?”, and statements like, “You are working with a person, not a company”, shows Penko’s true care for the client, not just on a professional level but also on a personal level. We are remarkably proud of Penko and look forward to seeing the results of success his article and advice produces—not just for the clients of the people who read it but also for how it helps the reader become aware of the true reason of why they are doing business—To not only provide a great service but to also make the client feel valuable while doing so. Congratulations Penko! We’re very proud and glad to have you working as a member of our team! We look forward to the many successes that you help contribute towards in our company’s future!